I’ve been needing a coat rack for a while. I live in a cold enough climate where you need a coat or jacket for at least half the year, and I have 3 or 4 that make the rounds depending on the occasion and the weather. Throwing them over the back of a chair just wasn’t cutting it anymore. I’ve had a broken stand-up floor lamp hanging around for a while. 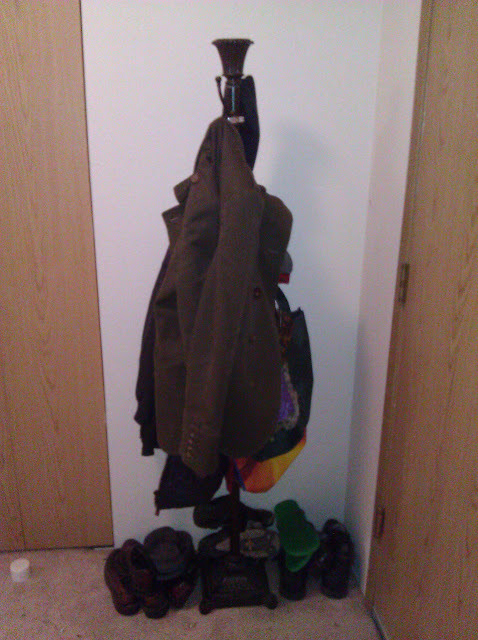 It’s the perfect height to be a coat rack, and has the benefit of already being in my apartment. 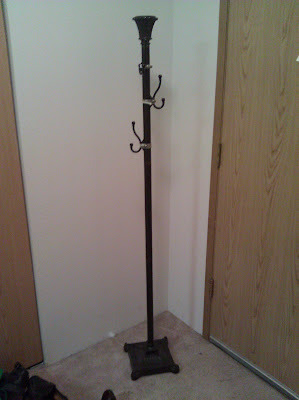 A quick Internet search showed commercial coat racks available for around $40-50. I was fairly sure I could do better, and a quick trip to Home Depot confirmed. I purchased 4 coat hangers, and 4 pipe clamps. It turned out, by luck, that the width of the pipe clamps was perfectly inside a decorative notch – so it can clamp in and not slip out. Now it’s holding up my coats, reusable shopping bags, umbrellas and is keeping an eye on the shoes parked under it. The cost of the materials was about $12 from Home Depot. If the pipe clamps had been copper or black, the entire thing would look very well matched…but as it is, it’s good enough for the corner behind the door. 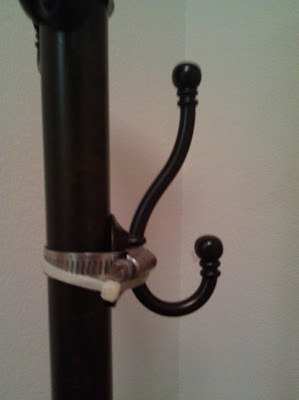 This entry was posted in DIY, Projects and tagged coat rack, diy, floor lamp, hanger, hose clamp. Bookmark the permalink. I guess its important to have the base heavier then the pole! I created something similiar to this and it never lasted for me! Although yours seems more stable then mine did!